Home » Blog » Artist Tours » Use Code THANKS18 to Save 15% Off Tickets! As we enter the fun-filled holiday season, we’re feeling particularly grateful for our Disco family who join us year-round to fill the floors with dance. The music we love has brought us together once again, bringing many happy moments. To thank you for blessing us with your friendship, we wanted to share a special offer to take 15% OFF select club shows! With a cornucopia of events running in all corners of the country, feast yourselves on our abundant harvest of productions this fall. There’s more than enough to go around including a variety of electronic artists and venues. Fortunately, you can enjoy a 15% discount on tickets, by entering the code THANKS18 online at checkout. 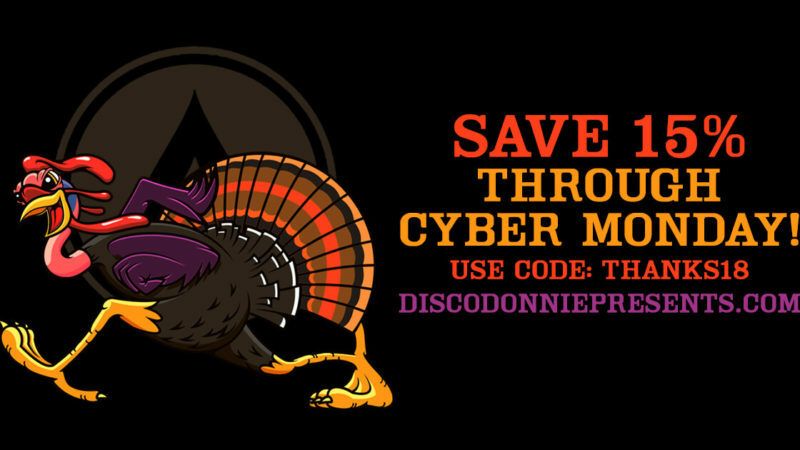 Don’t hot potato this deal, gobble up the savings with a week-long sale running until midnight (11:59 PM PST) on Cyber Monday, November 26th. Some exclusions may apply, browse the complete list of participating events below. For St Louis events, please use code FRIDAY.